Gold dropped for a third session Tuesday and closed below $1600 an ounce for the first time since March 15. Gold for April delivery declined $8.80, or 0.6%, to settle at $1,595.70 an ounce on the Comex in New York. Prices moved through a fairly narrow range of between $1,593.40 and $1,605.00. "Gold is finding it difficult to take its cue from other markets where sentiment remains confused at best," TD Bank precious metals strategists said in a note relayed on Reuters. Cyprus and its bailout deal remained in the headlines. "A new precedent has been set," MarketWatch quoted David Beahm, executive vice president at precious-metals investment firm Blanchard & Co. "Taxing deposits just goes to show how desperate things have gotten and that nothing is safe anymore. If you don’t hold it, you don’t have it." Silver traded lower as well. Silver for May delivery fell 13.6 cents, or 0.5%, to $28.679 an ounce, ranging from $28.605 to $28.845. The white metal advanced 12 cents on Monday. July platinum declined $17.10, or 1.1%, to $1,569.80 an ounce, trading between $1,563.10 and $1,591.60. The outlier in precious metals was palladium. Palladium for June delivery gained $4.05, or 0.5%, to $761.40 an ounce. Prices ranged from $754.30 to $764.70. 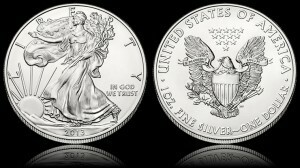 American Eagle bullion sales surged Tuesday according to the latest U.S. Mint figures. Sales included 10,500 ounces of Gold Eagles and a Silver Eagle pick-up of 918,500. Silver Eagle bullion coins have passed 3.3 million for the month. The monthly sales level is 12,000 shy of matching the total from February and 814,500 ahead of March of last year. Also, the silver coins have now topped 14 million for the year. Until this month, 12.4 million had been the sales high through the first three months of a year (the Silver Eagle series launched in 1986). In 2012, the bullion coins did not reach the 14 million mark until May 25. The following are the available daily, March and year-to-date bullion coin sales totals as reported by the U.S. Mint.